Season chicken with salt and pepper. In a large, deep non-stick skillet heat oil to medium-high. Fry chicken turning over regularly until chicken browns about 10 to 12 minutes. 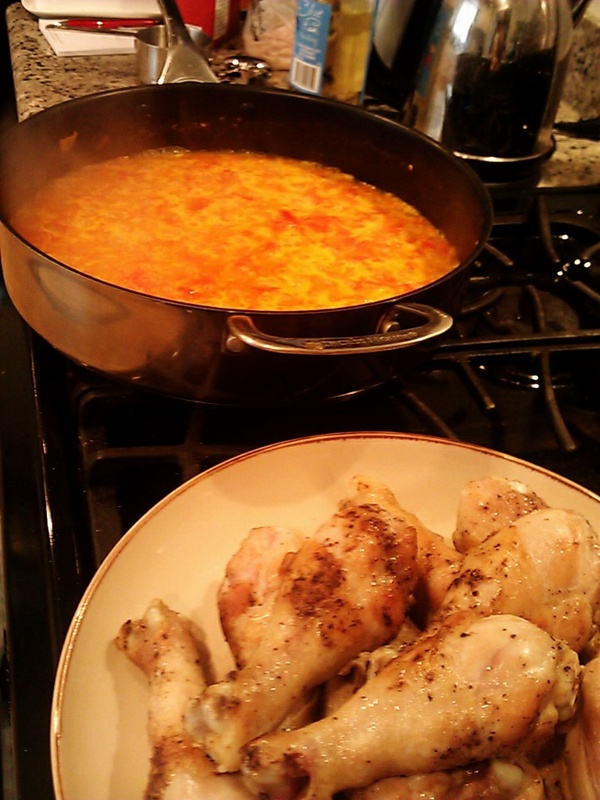 Lower heat to medium-low, cover chicken and cook 7 to 8 minutes until chicken is fully cooked through. Then transfer chicken to a plate. To the same skillet increase heat to medium-high and add onion, jalapeno, garlic, and season with salt and pepper. Cook until softened, stirring occasionally, about 6 minutes. Add tomatoes, cumin and saffron. Cook, stirring, until tomatoes break down, about 5 minutes. Add the wine and simmer until slightly reduced, about 3 minutes. Increase heat to high and add chicken broth and bring to a boil. Stir in the rice and return to a boil. 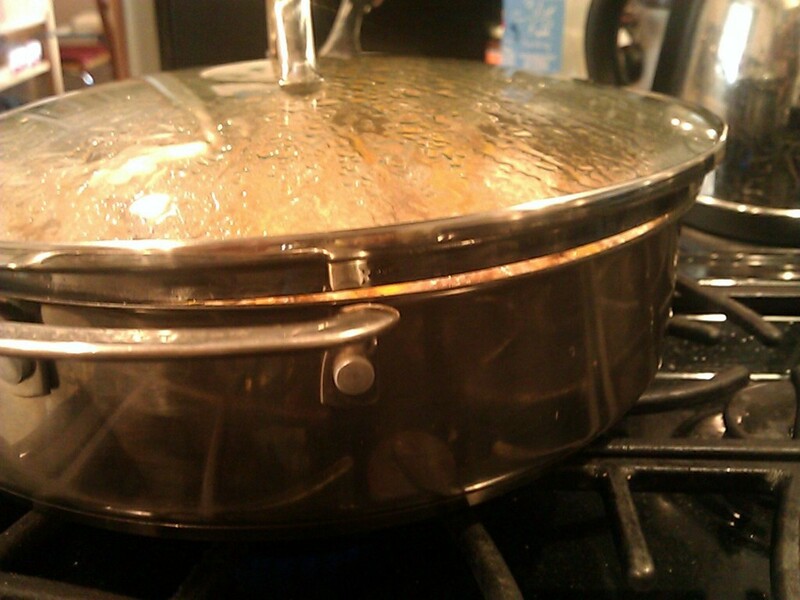 Reduce heat to medium-low, cover with lid slightly open (see picture) and simmer until liquid is absorbed about 30 minutes. Fold the cilantro into the rice and fluff the rice with a fork. Return the chicken, cover and heat for 5 more minutes. Then serve. 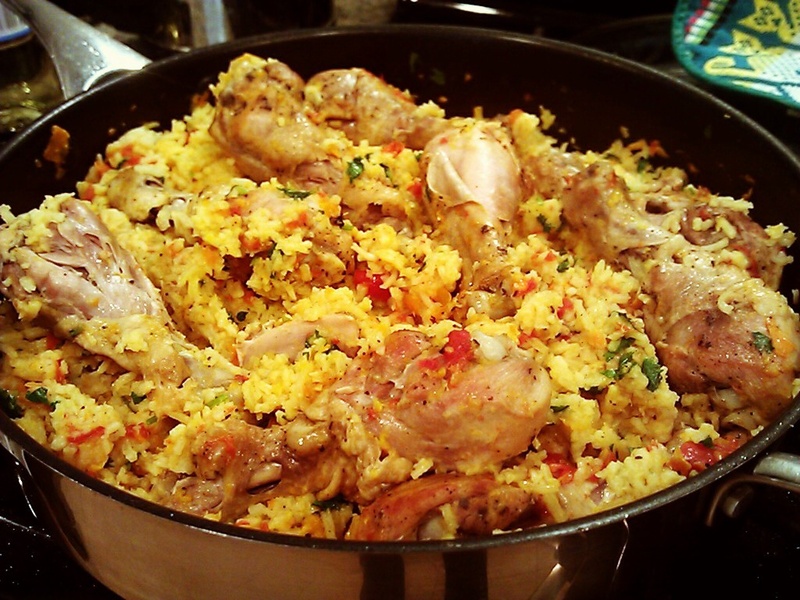 I love Arroz con Pollo, thanks for reminding me Liuba. I haven’t had it for a very long time. That looks absolutely delicious. Such lovely flavours. Looks like a great recipe and something different for a change around this house. Tell me – what do you think of using a wild rice with this rather than white? Hmm, I don’t eat wild rice at home. I have tried it though when it is served at The Fish Market restaurant with my wild snapper. It might make an interesting fusion of flavors with the tomato, onions and garlic.